The 274 is a heavy boat, but you should be able to tow it with the 5.7. Your truck will probably not like going up hills though. It looks like the 274 has a dry weight of 4600lbs (seems light to me) so even with full fuel, gear and trailer your gonna be under 7k pounds for sure. Your truck will pull 7k, but there might certainly be some times where it doesn’t seem like it wants to. Which one do you have, the Sierra? 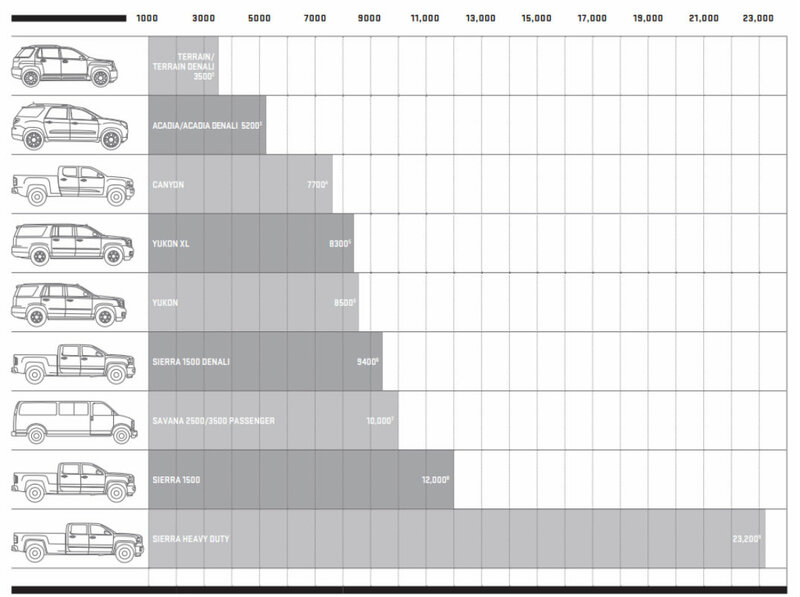 According to this towing capacity chart for GMC vehicles, you should be all set towing a Sunesta 274 if you have either the Canyon on up. What year is the boat also? I would love to see a test of a 23,00 pound trailer disconnected from a tow vehicle at 65 mph. I have walked into the weeds to see where a small trailer with no brakes end up. BTW, @ColdOne tows his 276SSX with an F-150 5.4 Lariat. I don't think he's ever had any issues and that's a pretty heavy boat, I think just a little heavier than the 274 Sunesta. I do tow my 276 SSX with my F-150 and have never had a problem going or pulling the boat out of the water. Plenty of power. The thing that scares the #&#036;^% out of me is stopping. Normal stopping is not an issue as my trailer has disk brakes on both axels but I’m not confident that in a panic stop that I would be able to stop as the boat does “push” the truck around quite a bit. so I only tow to and from storage and to and from the marina at the beginning and end of the season. So all in I tow maybe 50 miles a year. My truck is rated 10,200 # GVWR the boat is 6,800# the trailer is another 2,500# and with gear, gas etc I’m all over the 10,200#. On my last boat that I could trailer (my sig 290 is too big) came in on the same wight as yours. I too have a F-150. I never had to stop short, but I was nervous to if I had too!! Two things that helped was, the hitch https://store.schuckcushionhitches.com/300-series-hitches This type reduced the shock and the banging. The other, I just plainly kept my speed down. I did not care if people got mad or upset with me. What I was thinking that, all this wight can really kill me, my wife or somebody else. I just kept the speed 5 to 10 MPH slower than traffic. I’m not gonna pretend to know anything about Ford, but your F150 is not 10,200 gvwr. My 2500HD with Duramax is only 10k. Get your boat weighed. It probably weighs more than you think. My 220SSi weighs 6000 lbs on a tandem axle steel trailer and full fuel. Thank you all for the advice. I took the boat out on the freeway and it did really well. I am concerned about about a potential sudden stop . But over all the GMC 5.3 has done well.